The concert at the Olympic Gymnastics Arena was originally set to begin at 6 p.m. but was delayed about 17 minutes. 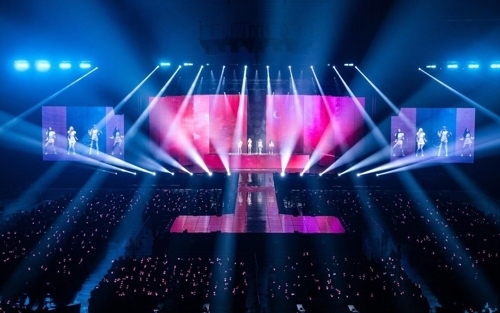 Fans, mostly in their 10s and 20s, shouted over and over when the members dressed in fancy white and pink costumes finally appeared on the stage. "Blinks, did you wait a long time today? Let's have fun until the end," member Jennie said, referring to the group's fan club members. As the 2-year-old group doesn't have many songs, half of the show was filled with covers and performance by guest singers. The quartet performed its original numbers "DDU-DU DDU-DU," "Forever Young," "Stay," "Whistle," "Really," "Playing with Fire," "Boombaya" and "As If It's Your Last. The group performance was followed by thrilling individual performances by each member. Jisoo covered American DJ Zedd's "Clarity," Lisa danced to famed Norwegian DJ Alan Walker's "Faded," and Rose covered "Let It Be" by The Beatles, "You & I" by Park Bom from the now-disbanded K-pop group 2NE1 and "Look At Only Me" by Big Bang's Taeyang. Jennie showcased the music video for her solo debut song "Solo" for the first time. The members then performed together again, covering American singer-songwriter Miguel's "Sure Thing" and "So Hot" by the now-disbanded K-pop girl group Wonder Girls. They also unveiled the stage performance for "Kiss and Makeup," the group's collaboration song with British singer-songwriter Dua Lipa. "It seems like yesterday that we were in a Dua Lipa concert, but that was one year ago. If we have another opportunity, we would like to join the stage with Lipa. Thank you very much," Black Pink said in a video message shown during the concert. A special guest performer was Seungri of the popular boy band Big Bang managed by the same star agency, YG Entertainment. He performed the group's hit numbers, such as "Bang Bang Bang" and "Fantastic Baby," and his new solo track "1, 2, 3!" in medley. "The Gymnastics Arena was where Big Bang had its first concert after its debut," Seungri said. "I'm sure Black Pink will stretch out to take over the entire world." He then playfully compared each Black Pink member to each one of his own bandmates. "I think Black Pink share a lot of similarities with Big Bang. Like G-Dragon, Jennie is always in Paris and keeps taking photos with fashion designers and posting them online. Lisa reminds me of Daesung, who has a bright aura and is full of energy, and Jisoo is like T.O.P, who is charismatic but unpredictable." He went to say: "When I see Rose, I think of Taeyang. She has strong vocals and has a lot of soul as an artist." Black Pink will hold another concert at the same venue Sunday. Korean R&B artist Zion.T will join as a guest. All 20,000 tickets for the two concerts were quickly sold out.